Meditation refers to the practice of completely quieting your mind so as to promote relaxation, build internal energy or life force, and develop compassion, love, patience, generosity and forgiveness. Meditation is an ancient practice. The object of meditation is to train the mind to stop thinking and free it of our usual clutter. Meditation has various benefits such as leading to relaxation, building internal energy or life force, also known as qi, ki, prana, etc. in different cultures. 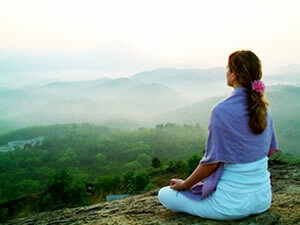 Meditation also helps develop compassion, love, patience, generosity and forgiveness. While the benefits of meditation are many, there are no negative effects. Hence, there is no actual reason for not doing meditation. This is especially true today, due to our highly stressful lives. So, how does one go about practicing meditation? Choose a convenient time. The time should be suitable to you and you shouldn’t be in a hurry to get to a meeting or worrying about a deadline. At this time, you should be completely relaxed and least likely to be disturbed. Choose a quiet place to meditate. There should be no distractions, and the environment should be calming and peaceful. Turn off TV sets, the phone or other noisy appliances. You can listen to soft music, especially ambient sounds like birds chirping or a waterfall. Wear comfortable clothes. Your clothes shouldn’t distract you and you should be as comfortable as possible. Keep a relatively empty stomach. Meditate before eating or after a light snack. Try not to meditate on a full stomach, because feeling full causes you to feel drowsy. The objective on meditation is to be relaxed but alert. Stretch before meditation. Effective meditation requires you to sit in a single position for minutes or hours at a time. So, you body might start to cramp after a while. Stretching beforehand reduced the chances of cramps. Sit in a comfortable position. Again, as you have to sit in that position for a long time, ensure that you are comfortable. Otherwise, your discomfort will distract you. Once you are ready, close your eyes. Even though meditation can be done with either closed or open eyes, it is easier for a beginner to meditate with their eyes closed, mainly because external visual stimulation can be distracting. Focus on your breathing. With your eyes closed focus on your breathing. This is one of the most basic and universal of all meditation techniques. Notice how you breathe in and then out. Don’t pass judgment on the breathing or try to control it, just be aware of it. It is okay if your mind starts to wander, just try to refocus on the breathing when you catch yourself wandering. You can also try imagining some calm mental pictures which will help you to relax and focus on the breathing, such as buoy floating in the ocean or a lotus flower unfurling its petals with every breath. Another technique is to repeat a mantra. This can be anything, your name, a word, or the traditional ‘Om’. The idea is to keep repeating the word over and over again until you silence your mind and enter into a deep meditative state. Keep a gentle smile on your face. After all, attitude is everything. A soft smile keeps you relaxed and peaceful, and makes you feel happy, rather than disgruntled. Once you are done, open your eyes slowly and gently. Don’t open your eyes quickly and start moving about. This will belittle the meditation experience. Open your eyes slowly and take account of yourself and your surrounding. Then, slowly get up and go about your day.